12/31/2011 : Happy New Years. New pics from our 2nd annual Toys For Tots are up. Be sure to check them out. Also some new merchandise in the online store. Big Thanks to everyone who supported our club in 2011. We hope to make 2012 even better. Merry Christmas! Thanks to all who have made the holidays brighter by donating / and attending the local Motorcycle Clubs charities. 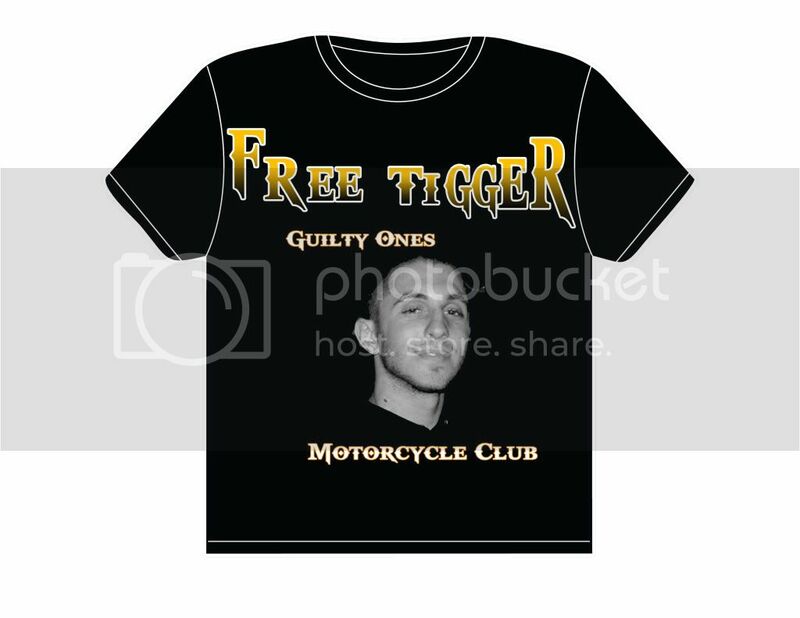 12/12/2011 : Guilty Ones Motorcycle Club is proud to announce online sales of our T-Shirts. They will ship to anywhere in the U.S.
12/11/2011 : Our 2nd annual Toys For Tots Event turned out even better then expected. If you missed out then make sure you get there next year. So many people to thank. First off want to thank all of the Guilty Ones Members & Prospects for there hard work. And we couldnt have done it without all the other clubs, friends, and family participation. 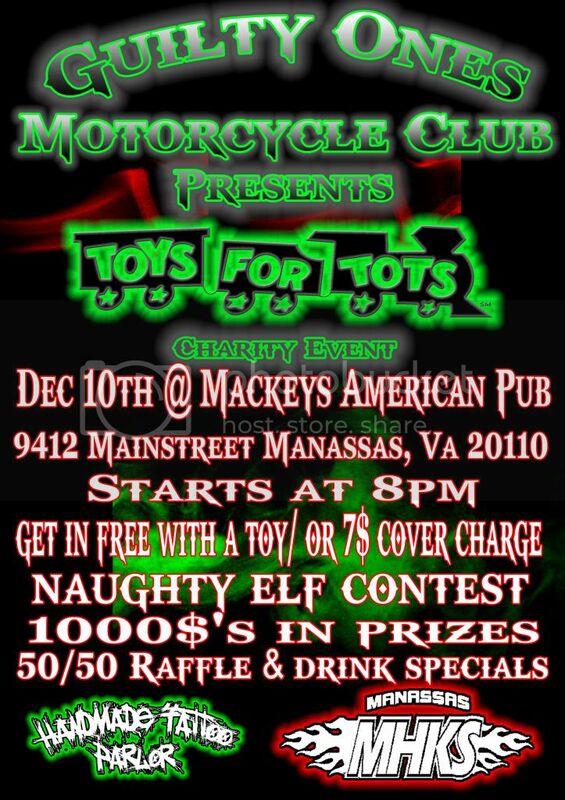 Huge Thanks go to : Mackeys American Pub, Handmade Tattoo, Devil Tail Designs, Mohawk Ryderz, Blood Tight Ryderz, Game 7 Ryderz, The Fellas MC, MHKS, Dj Casper, Threads Ink, and ALL THE NAUGHTY ELFS! pictures are soon to come. 12/6/2011 : Its almost time! Get out to the stores and get some toys for tots. Then head to Mackeys this saturday and help us fill the boxes. Thanks to everyone who helped make this event happen. 11/13/2011 : Had a great time at the Handmade tattoo party. They had a great turn out. Now concentrating on our Xmas party. Ladies there is still time to sign up for our naughty elf contest. All that is required is for you to show up with a hot outfit on (elf / xmas) and you could win 500 $. If you have events coming up be sure to email us with the info. Also find a review of the 2012 Zx14 here. 10/7/2011 : Looking to find a good deal on a local motorcycle. Check out Cheapmotorcycledeals.com . They do all the work for you. 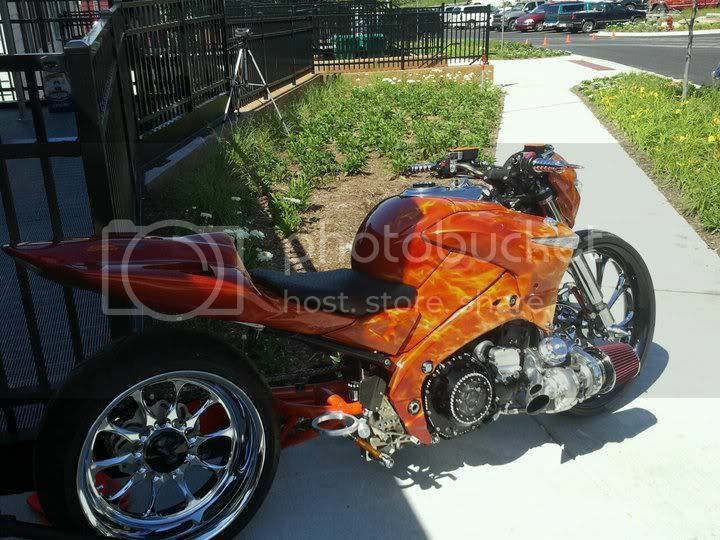 9/28/2011 : Are you looking for a new sportbike emag? if you are i found a great one. BlingRockets has a free subscription emagazine that not only has great shots of tricked out bikes and girls, but also has stunters, parts, merchandise, and event coverage. 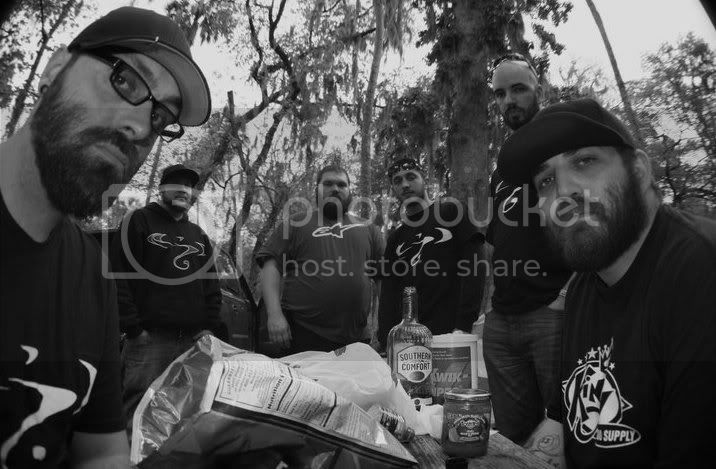 Check out some of there photos under are Chicks On Bikes album. 9/25/2011 : snagged this ride of the century video off of stuntride.com Pretty sic. 9/18/2011 : It may have rained at bike week, but we still had a hell of a good time. 9/14/2011 : Guilty Ones MC will be leaving for Ocean City Bike Week Tomorrow from springfield at noon. If you wanna meet up in OC message/ text us. 9/11/2011 : Rattle The Runway. Never Forgetting 9-11. More Pictures Here. 9/10/2011 : An old video but still good. Dont forget were meeting up at 8:30 tonight for zero's bday and we got Rattle The Runway Tomorrow. 9/7/2011 : This sundays ride will be RATTLE THE RUNWAY. Were leaving chantilly hooters around 8am. This is a memorial ride from the National Air and Space Museum (Steven F. Udvar-Hazy Center) to Dulles International Airport to the Pentagon in memory of 9-11. More info can be found here. This is a rain or shine event. 9/2/2011 : Ryan Danger has taken the win at the 2011 Ducati Monster Challenge FINALS. Thanks to everyone who helped him get there. Congrats Ryan. 9/1/2011 : Just got word that the orders for long sleeves and hoodies should be done by the end of the week. If you don't ride with us, but would like to stay updated on events, activities, and new merchandise click on our supporters list tab and add your email address. Looks like we got a Sunday ride being planned out to Harpers Ferry. Congrats to Bill Dixon for taking the 2011 XDL title. 8/30/2011 : Steve-O at VIR. Repping G1MC. 8/21/2011 : Ocean City Bike Week is getting planned. Update: Leaving early on 9-15-2011, coming home 9-18-2011. House has 5 bedrooms (located in bethany beach)and is approx 12 miles from ocean city. Price to buy in is 50$ per person. Right now we have 8 confirmed going. ALSO: The G1MC facebook page has reached over 1200 friends. All family, friends, clubs, riders, and supporters. Be sure to add us. 8/19/2011 : Dont forget that another Guilty Ones Toys For Tots is in the making for December. Times, dates, and locations will be given early. Last years turned out great and we plan to double the toys this season. Dont make plans! you wont want to miss this. 8/10/2011 : Getting some fresh ink? Take a look at one of our sponsors - Handmade Tattoo Parlor. You wont be disappointed. Check out their work on there FB page, and you can find directions and reviews here. 8/4/2011 : Need work done on your bike, or looking for accessories? dont get screwed by most of these local shops! Check out Manassas Honda Kawasaki Suzuki in Manassas (MHKS), or Fairfax Cycles in Fairfax. They stand by their work. 7/24/2011 : Have you seen this one yet? 7/24/2011 : Maryland International Speedway's Bike Fest. G1MC will be there on the 24th. Meeting up around noon. Text or email if you wanna go. 6/5/2011 : Guilty Ones MC Bikini Bike and Car Wash at NTB and Hard Times Cafe between 12 and 3. dont miss out. Pictures will be posted under the pictures link! 5/18/2011 : New look for stunt riding videos. Much respect for changing it up. Great video. 5/5/2011 : Mid-Cal Stunters show a craiglist poser how to stunt..LMAO!